Dragon Ball Fierce Fighting v2.1 has added Vegeta and Freeza, two new characters. Special character can fly. 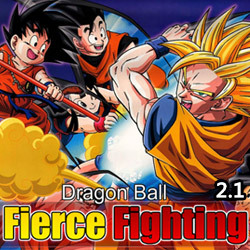 Dragon Ball Fierce Fighting is going to come to an end. Play the game right away to defeat the big devil king! player1: AD to move, J to attack, K to jump, L for Qi storage, UIO for special skills. Key combination: AA/DD for sprint, S+A+J for Qigong, AA/DD+J for Dash Attack. Players2: Arrow keys to move, 1 to attack, 2 to jump, 3 for Qi storage, 456for special skills.